This is part 2 in an arbitrarily long series where I review papers from Gilles Laurent's lab. Last time I looked at four early papers from Laurent's lab, which described the basics of how insect olfaction works. They showed that when you present a locust with an odor, their olfactory centers' LFPs oscillate at 20Hz, and antennal lobe (AL) neurons fire action potentials in sync with the LFP. 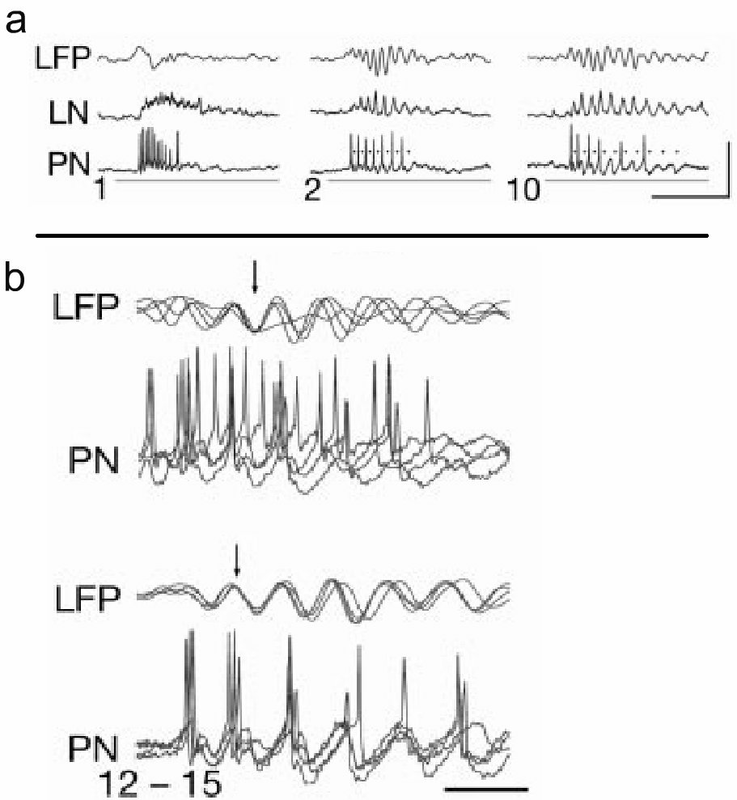 Macleod and Laurent further showed that blocking GABAA transmission abolishes the LFP oscillations, presumably via local neurons (LN) in the AL. Today I'm going to cover three papers by Mark Stopfer, a post-doc in the Laurent lab around the turn of the millenium. And bees do it too! Laurent started investigating insect olfaction in locusts, which do not have well-defined, manipulable behaviours. To start doing behaviour, Stopfer and Laurent repeated all of the locust experiments in honeybees, which extend their proboscis in response to sugars (proboscis extension reflex, PER). And when I say repeated, I mean almost literally repeated: they showed that the honeybee MB LFP oscillates at 30Hz, that GABAAinhibitors abolish the oscillations, that projection neurons respond to subsets of odors, etc. 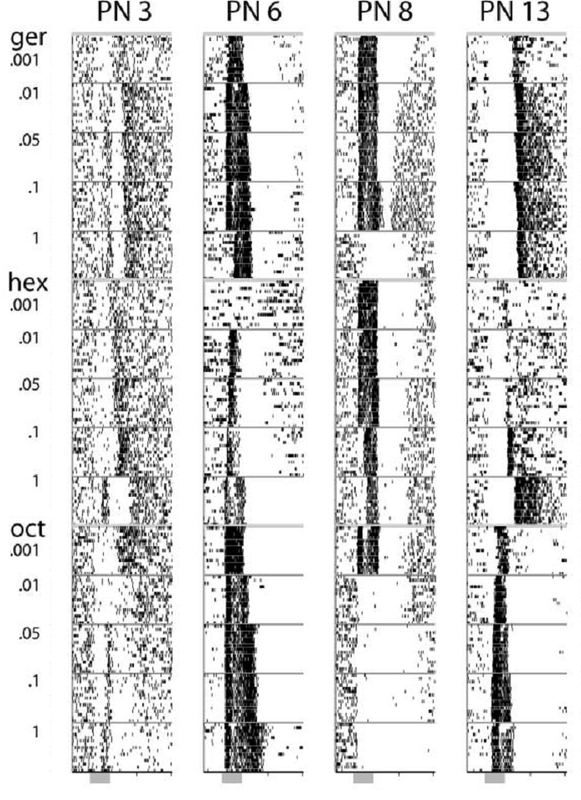 Stopfer and Laurent (1997)'s first three figures recapitulate previous work, only this time in the honeybee. a, figure from Macleod and Laurent that shows (top) PN response to odors, and (bottom) the LFP-PN correlogram before (left) and after (right) picrotoxin. b, parts of figures from Stopfer and Laurent (1997) that show the same thing in honeybees. Having established that the honeybee's olfactory processing is similar to locust's, they performed a conditioning experiment. They trained bees to associate the odor octanol with sugar, then tested the bee's PER in response to three different odors: octanol (C), a similar odor hexanol (S), and a dissimilar odor gerianol (D). Saline-treated bees were able to discriminate between the similar odors, and had a higher PER for the conditioned odor (see below); they did not respond to the dissimilar odor. They then repeated the conditioning experiment in bees with a GABAA inhibitor in the AL, and found these bees were not able to discriminate between the conditioned and similar odors; the bees were still able to discriminate the dissimilar odor. The discrimination effect wore off after one hour, showing it was a problem in discrimination, not learning. GABAAblockade reduces odor discrimination. Bees were tested on their PER (y-axis, percent that extend) to conditioned (C), similar (S), and dissimilar (D) odors. Saline-treated bees were able to discriminate the odors, while picrotoxin-treated (PCT, GABAAinhibitor) bees were not. Having griped about the first three figures, I must admit this is a nice result. I would have liked to see a larger odor set, perhaps finding a companion odor to their "dissimilar" odor, gerianol. The Carlson lab, when investigating odorant receptor responses used dozens of odors, and characterized their similarity. Perhaps Stopfer got tired of bees after using 1000(!) of them. In the discussion, Stopfer claims that these experiments show how important the LFP is in shaping responses to similar odors, but do not provide any explanation of how. My guess is that since PNs fire APs in the presence of PCT, the effect of the LFP desynchronization is not in the AL, but downstream in the mushroom body (MB). I believe the paper that investigated this in Perez-Orive, 2002. Two years later, Stopfer and Laurent published a paper using a protocol near to my heart: they simply manipulated the stimulus and saw what happened. They returned to locusts, and recorded intracellularly from PNs, LNs and the LFP in the MB. They then presented odors to naive locusts ten times (1s odor pulse, 0.1Hz), and found that all the responses evolved over the ten presentations. 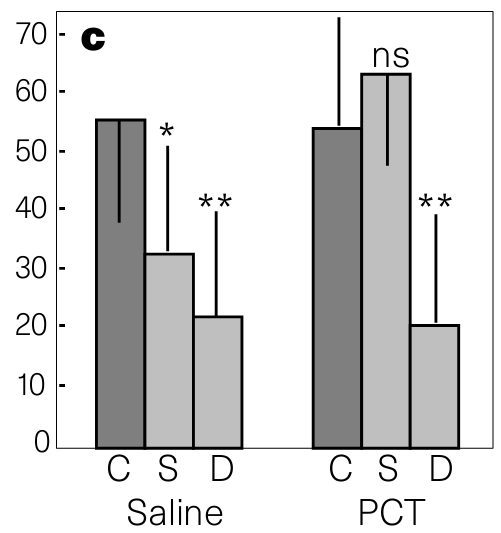 During the first trial, the PNs and LNs had strong EPSPs, and PNs fired many action potentials. On subsequent trials, however, the EPSP amplitudes and action potential number both shrunk (see below). However, while the amplitudes had decreased, the precision had increased: the LN EPSPs and PN action potentials both became synchronized with the LFP. In contrast to the decreased strength of the AL neurons' responses, the LFP in the MB increased in strength over the trials. LN, PN, and MB LFP all change with repeated stimultion. a, example traces from the LFP in the MB, and intracellular recording from LNs and PNs. Trial number below. b, during early trials (top), the PN action potentials are not synchronized to the LFP. During later trials (bottom), they are synchronized. Having observed the basic phenomenon, they then varied the stimulus. They found the adaptation occurred for odor pulses ranging from 0.25-2s, and for inter-pulse intervals of 2.5-25s. They tested whether the adaptation could reset, and found that after a 2 min interval the adaptation was diminished, and after 12 minutes was nearly gone. They tested whether the adaptation was odor specific, and found that indeed, it was odor specific, but could overlap with similar odors. Finally, they tested whether the adaptation was central or peripheral by splitting the antenna in two via a barrier, applying the odor ten times to half the antenna, and then testing for adaptation on the other half; it was still there, showing the adaptation was central (given that I blocked the nostril of a mouse, I would love to see that experimental setup). Having explored the stimulus space, they then tried to find the advantage of this adaptation. To do this, they created a classic odor predictor, turning the spike trains of PNs into n-dimensional space, and calculating the minimum distance between a given trial and templates for each odor. To differentiate early and late responses, they used two templates: the first was simply the response to the first trial; the second was the average response of the past three trials. When predicting the odor by comparing to the first trial, the odor predictor got worse with each trial; when predicting by comparing to recent trials, the predictor got better. Thus, they conclude that while PNs fire less after repeated stimulation, the increase in precision (and thus decrease in noise) increased the information in the system. Odor prediction diagram, and results. Top, they compared a given trial, at, to a template, bt. For their "first trial" predictor, each trial was compared to b1. For the "last 3 trials" predictor, each trial was compared to the average of the last three trials. Bottom, odor prediction failure rate for both scenarios. d. The first trial predictor is best for early odors, but quickly gets worse. g. In contrast, the average predictor gets better with each trial. While this adaptation is interesting, it is difficult to draw parallels to mammalian olfaction. Each trial here is analogous to a single sniff in mice, and indeed I have found that the odor representation changes with each sniff in mice. However, the time scales are very different. 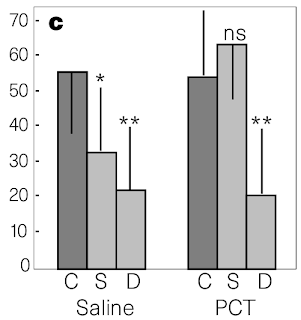 In mice, each sniff is separate by 250ms, not 2.5s; and the adaptation resets in the 10s between trials, not the 2 min. shown here. Furthermore, the increase in precision may not be important for mammals. Mice have been shown to perceive odor identity in a single sniff. In 2003, Stopfer published another paper that used a simple protocol to examine the olfactory system. This time, he presented locusts with odors ranging in concentration over three orders of magnitude. They found that the MB LFP, and LN EPSPs both increased in magnitude with increasing concentration. In contrast, PN firing rate was flat across all concentrations, although there was an increase in LFP phase precision. This increase in precision could explain how the LFP amplitude increased, despite the flat firing rate. They then focused on individual PNs, and found that PNs could respond completely differently to the same odor at different concentrations. There was no clear trend in these changes. Four example neurons' response to odors at different concentrations. I leave finding the changes as an exercise for the reader. Given these different responses at each concentration, they asked how a downstream neuron could possibly identify an odor at different concentrations. To do this, they built a population vector for the entire response, binning cells' responses into 50ms bins. 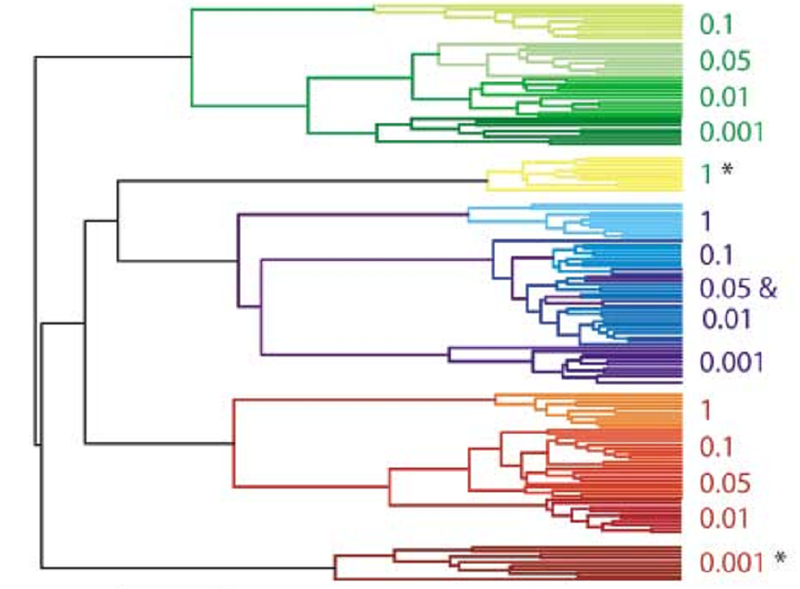 They then ran a clustering algorithm to see how similar each odor-concentration representation was. Odors at different concentrations clustered together, rather than intermingling with other odors. Different concentrations of the same odor cluster together. Dendrogram of similarity for three odors (red, blue, and green), at five concentrations (numbers at right). Different concentrations of the same odor generally cluster together. They also ran various odor prediction algorithms, and showed odor trajectories in PCA space. The upshot of all of this was that while individual neuron's responses to an odor can vary with concentration, the population as a whole is more "stationary," which would allow decoder neurons to maintain odor identity across concentrations. In the final figure of the paper, they took a peek at the decoder by recording Kenyon cells in the MB. Kenyon cells could be split into two groups: some cells responded to an odor at all concentrations (30%), while others responded to odors only at a specific concentration (15%). To date, I believe this is the most complete exploration of how concentration is coded in the mitral cells/antennal lobe. Some work has been done in anesthetized rodents, but the standard now is to record in awake animals. There have also been a large number of imaging studies in glomeruli that show that more glomeruli (and thus ORNs) are active as concentration increases. Whether this would translate into more neurons being active at higher concentrations, a shift to earlier spike times, or some other phenomenon is unclear. How this would be decoded downstream in cortex is also unclear. That's it for today. Only a dozen or so more papers to go! I like this post-doc centered format, so next time I'll take a look at Rainer Friedrich or Rachel Wilson's work.